Africa is on the rise. For the past decade the picture has been steadily improving both economically and politically. No longer is it the ‘hopeless’ continent whose media narrative was one of war, famine and poverty. It is now the continent of hope and rising prosperity where technological advancements developed there are being exported back to its one-time colonial rulers. The media perspective too is more positive as evidenced by recent glowing reports from the Financial Times and the Economist. Companies once put off by the riskiness of investing in Africa are now establishing operations locally to take advantage of its expanding economy and population. Today Africa as a region is growing faster than Asia. According to the IMF, seven out of the 10 fastest growing economies in the world will soon be African. The World Bank estimates that Africa is currently at a point where China and India were 20 or 30 years ago and poised for a similar rapid economic expansion. Like those countries, Africa is also set to reap a demographic dividend. Already the world’s second largest continent by population (and area), its population is expected to more than double by 2050. During this time it will produce ever increasing numbers of adults of working age who will help facilitate – and take advantage of – further economic growth. This will help rebalance its economy away from commodity-fuelled export growth of today (thus reducing tensions with an increasingly active and influential China), to one driven by consumer demand served by a local manufacturing base. All this growth has created a new local economic and political force – the much-lauded African middle class. The African Development Bank has classified that segment of the population that lives on $2-$4 a day as the ‘floaters’ at the bottom of Africa’s middle class. By this (admittedly generous) definition the middle classes number 300m today and are expected to increase four-fold over the next 40 years. It is not their absolute wealth that matters here, more that they are a large consumer block with discretionary spending power who, through exposure to television and internet, are becoming more brand savvy. Increasing urbanisation means that this group are now easier to serve for the fast moving consumer goods companies (FMCGs) that are attracted to the continent. These companies are actively targeting Africa for growth as revenues in their traditional home markets have matured. According to a recent report by McKinsey, revenues for consumer-facing industries in Africa should grow to $410bn by 2020, with consumer goods accounting for 45% of that. This creates a unique opportunity for those FMCGs wishing to operate in Africa. And many do, with around 70% of the world’s top FMCGs already present there with more to follow. However given the difference in consumer affordability and tastes with their home markets, companies are having to tailor their products for the African market. For instance, SABMiller makes a sorghum and a maize based beer (an acquired taste) for the eastern and southern African markets. Their locally sourced ingredients mean that they retail for one quarter the price of an equivalent bottled beer. Samsung too make a fridge that keeps food cool during black outs. There are also mobile phones aimed at the African market. Feature phones still dominate but as the reliability and capacity of data networks improve there are an increasing number of smart phones being manufactured for Africans. Nokia has a range of smart phones that retail for less than $100, some of which have dual-sim and are capable of operating on both 2G and 3G data networks. There are a number of Chinese manufacturers who are designing smartphones that will retail at $50 or less. Of course mobile technology is one industry where Africa takes a leading role with Kenya being the birthplace of mobile money. East Africa has become a hub of mobile app development with local start ups creating software with local content aimed at the local market. Some argue that this may take the place of manufacturing in the future, with Africa exporting mobile technology software to the world, as China and India do today with manufactured goods and IT services. However despite relatively developed mobile communications infrastructure, poor infrastructure elsewhere eats into the otherwise healthy margins that consumer goods companies experience in Africa. This is most obvious with physical infrastructure, such as roads or electricity but it is also true in financial services such as payments. FMCGs are increasingly setting up manufacturing bases on the ground and sourcing supplies locally. As many of the payments in their supply and distributions chains are still in cash, unnecessary costs and inefficient processes are introduced. 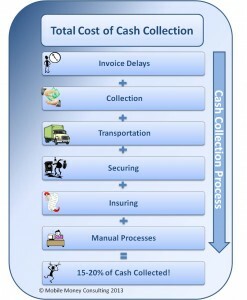 As highlighted in a recent white paper, on collections alone this can cost companies up to 20% of the value collected. However help is at hand. FMCGs operating in Africa can leverage off of existing mobile technology to introduce mobile payments into the supply and distribution networks. With the right financial services or mobile operator partner, they can reduce the direct costs associated with paying and collecting cash, as well as eliminating inefficient processes. This in turn gives those companies a competitive advantage in their sectors and allows them to gain market share in rapidly expanding economies. In my next post I will be focusing on one sector within consumer goods that has enormous potential for growth in Africa – the brewing industry – and highlighting the favourable economic and demographic conditions that exist for exponential growth. As part of that I will examine how mobile payments can be introduced into supply and distribution systems, allowing brewers to substantially reduce costs, improve processes and capture market share. In our previous postings (here and here) we introduced the concept of Corporate Mobile Payments and illustrated how they not only present corporations with an unique opportunity to reduce inefficiency and eliminate overhead, but also how they can act as an industry driver for the entire mobile payment ecosystem. Today we release a White Paper that examines this topic in greater detail. With input from recognised industry leaders such as Citi, MasterCard, Vodafone, Visa, Barclays, Airtel and the IFC, we explain the unparalleled opportunity that Corporate Mobile Payments presents to both corporations and the mobile payments industry alike. You can find the paper on our dedicated White Paper page or by clicking the document icon. 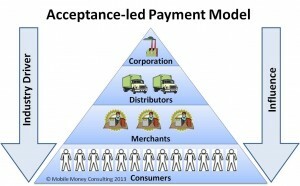 Can Corporate Mobile Payments be the Driver for Merchant Mobile Payment Acceptance? In our last blog we raised the question of how to encourage merchant acceptance of mobile payments so that consumer demand for such payments might also be stimulated. We highlighted the conundrum that exists for physical card payments in many emerging markets, where, despite issuance and demand from consumers for these payments, the lack of merchant acceptance means that they are yet to take hold. The same problem exists today for mobile payments. So, how should we incentivise merchant acceptance of mobile payments? What if they too had a reason to use them as well as accept them? If corporations and their distributers were to start accepting mobile payments then merchants would also be encouraged to do so too. Whereas the direct benefit to merchants of acceptance may not be immediately obvious to the merchants themselves, it is surely obvious to those corporations, such as consumer goods companies, that have to engage in cash collection. The cost of cash collection, especially in less developed markets, can be as much as 20%, especially when the cost of transportation, securing and processing are considered. Even in developed markets this can approach 10%. And, in certain markets cash sales can comprise 75% or upwards of revenue, meaning that cash collection can be a massive overhead for many companies. Mobile can eliminate most of this cost. If companies can save as much as 20% on the cost of collecting cash just by using mobile, then they have every reason to encourage mobile payments -or mobile collections – through their distribution and supply chains. And what better way to incentivise your distributers and merchants to pay with mobile than to pass on some of those savings in the form of discounting for invoices paid by mobile? For that to happen the merchant will need to be in possession of his/her own mobile wallet which can be funded either by topping up at a bank or an agent, or – more pertinently – by accepting mobile payments from consumers. Incentivisation of mobile payments through discounting could even extend to the consumer, thus adding a clear value proposition where there is uncertainty today. Of course this logic doesn’t just apply to consumer goods companies and can be extended to other industries, particularly where cash comprises a proportion of revenue collection. This top-down, acceptance-led development of the mobile payment ecosystem runs contrary to much of the models in existence today, where it is assumed that demand will be driven upwards by the consumer. But it is every bit as important and could potentially be more successful if savings are passed through the supply chain. 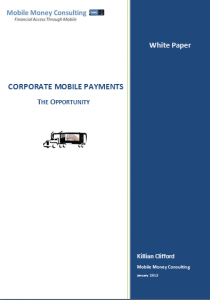 Next week Mobile Money Consulting will be releasing a white paper on the topic of Corporate Mobile Payments highlighting the opportunity to the industry. The paper will provide insights and advice from industry leaders, as well as explaining the concept in more detail. Please ensure you check back to get your copy. Who will drive Mobile Merchant Payments – Consumers or Merchants? The GSMA recently issued a discussion paper on mobile merchant payments (or eWallet Merchant Payments as they label them). In it they laid out three conditions that they felt needed to be in place to drive customer uptake of mobile merchant payments – namely consumer demand, a clear consumer benefit, and an eWallet stored value (i.e. a positive balance on your mobile wallet account). With the second of these conditions being the most critical (if there is no benefit to the consumer from using mobile payments they will not switch from cash), and the third only really applying in the case of mobile-led offerings (bank-offered wallets can draw down from linked bank accounts), it is perhaps the first condition that is most open to debate. Does a latent consumer demand need to exist for mobile merchant payments before merchants start accepting them – or is it the case that merchant acceptance itself will be a catalyst for driving consumer demand? To say that consumer demand will be a primary driver for merchant payment acceptance is to ignore how card companies first developed their business models. From the issuance of the first store and charge cards through to the development of credit cards, the business model has been ‘acceptance-led’. That is, it was the merchant’s willingness to accept card payments that drove customer demand rather than the other way around. Merchants were happy to accept these payment as they generally denoted a more credit-worthy and higher-value spend customer. Once card payments (and their associated loyalty bonuses) were more widely accepted, consumers were in turn happy to use them and thus demand was stimulated. Today the card payment business model is less about loyalty (though clearly that is still part of the business model for some) and more about the convenience of not having to carry large amounts of cash around. However in many emerging markets, card payments have been slow to be adopted primarily because of issues around merchant acceptance. 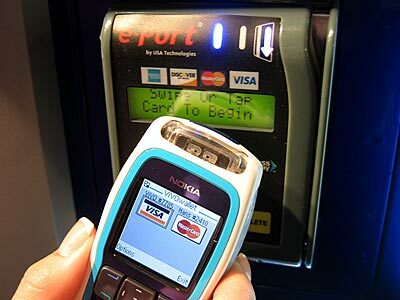 Often this will be due to a lack of willingness to pay the interchange fee, the high cost of the POS terminals or the lack of reliability of the communication networks that those POS terminals depend on. Cards are being issued in these markets and consumer demand exists, but due to the lack of merchant acceptance often there is nowhere to use them. Mobile payments can clearly circumvent some of the issues around POS cost and communication reliability but the problem of merchant acceptance still remains. So how do we translate the card payment ‘acceptance-led’ model of old to the modern mobile payment business model of today? How can we drive merchant acceptance of mobile payments, particularly in emerging markets? And what incentives do merchants have to accept mobile payments in the first place? Once we can answer these questions, then we can look at how to encourage consumer demand for mobile merchant payments. That is a theme we will be returning to here in the coming weeks. With the number of mobile money licensees in Nigeria up to 14 and counting, mobile money operators face a lot of competition when it comes to attracting potential customers. So far there has been little differentiation in terms of product offering with just about all operators offering standard P2P transfer and bill payments. One area however where operators can stand out from the crowd is pricing. Those that have raised their head above the parapet (most haven’t yet) and released their pricing show a tendency to favour percentage-based charging (typically 2%), subject to maximum and minimum fees. There is little evidence to date of tariff-based pricing. It is interesting to note how transaction fees are significantly cheaper in Tanzania than in Kenya due to increased competition in that market. This is the yardstick that should apply to Nigeria as it has four times the number of mobile money operators and, if anything, the competitive environment will be more intense. Comparing those prices already publically released in Nigeria – Monitise and MTN (GT and Fortis) – with those of Tanzania doesn’t make for comfortable reading from a financial inclusion perspective. As it stands, those wishing to make micropayments in Nigeria would be priced out of the market. If financial inclusion is genuinely a goal for mobile money operators, it will be difficult to achieve with this pricing*. However, even if the mobile money operators wanted to reduce their tariffs for smaller transactions sizes, could they afford to do so? One disadvantage of not having a mobile operator (MNO) led model is that it adds an extra layer of cost to the service –the cost of accessing the mobile communications network (i.e. SMS, USSD). For a MNO-led model, this access can be offered at marginal cost, which is effectively close to zero. However for a non-operator led model, as we have in Nigeria, the MNO’s are understandably keen to offer this access at commercial rates. And by all accounts they are driving a pretty hard bargain – the mobile money operators in Nigeria would effectively have to loss lead on the lower transaction amounts to match the fees we see in Tanzania. In all likelihood most of the mobile money operators are still fine tuning their pricing strategies and we could yet see prices lowered for smaller transaction sizes. But with the mobile network operators firmly digging their heals in over cost of access the suspicion is that they may not be low enough to promote financial inclusion for the very poorest. * Monitise are at least more competitive on larger transactions sizes, which may well make business sense for them given that the average transaction size in Kenya is in the region of $33.